2 1/2 years ago, when we realized that we wouldn't be moving to a new house, we started to consider our options for increasing our livable space. We considered a full-blown addition -- but the equity we could have used went into the backyard and the pool we decided upon before we knew L was joining our family. We considered converting our garage into a room, but with no basements, that would mean our limited storage space would become pretty much non-existent. We considered closing in our back patio. For a variety of reasons, this is what we decided to do. 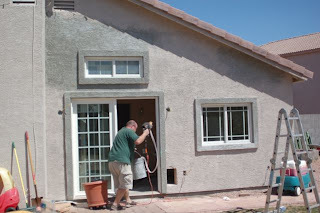 Last summer, DH framed in the room and we contracted with someone to mud and stucco the outside. Then . . . things happened and funds got tight and the room sat. Thanks to a few different blessings, we were able to get started again and our room is almost complete. We decided to cut a few cosmetic corners, but the room will make a great office for us and L will have her own room. Thanks to DH's amazing handyman skills (he ran the ductwork for hvac system, ran the electrical, framed the entire room, insulated & installed drywall, painted, etc. ), careful shopping, bartering and some pure luck - closing in the patio was an extremely affordable solution to tight spaces. Here are some pictures to show our current status. We still need to lay the tile, but once that is completed, we can begin moving our office into our new room. 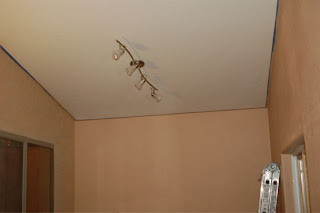 One of the 3 new light fixtures in the addition. We have 2 of these track lights, and a new sconce by the doorway. You can still see the orginal window on the left that is over our kitchen sink. 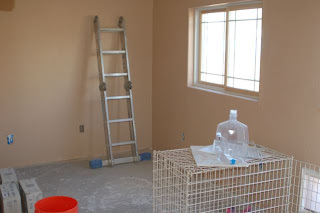 Our original plan had been to cover that window and drywall that wall -- but we decided to leave it for now. Shot of the room, painted. This is some of the "oops!" paint I wrote about last week. That big opening used to be a 6 foot sliding glass patio door. Bo will finish it, but it will stay open between the office and kitchen. 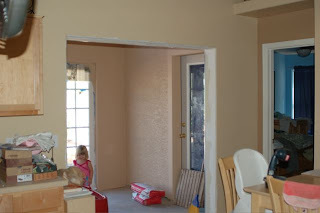 You can also see the exterior door that went from our patio to our bedroom. Another cosmetic thing that we were going to cover, but decided wasn't in the budget for now. Painting the exterior to match the rest of the house. You really can't tell from the outside that it used to be a patio! It looks great! I think you'll be happy having the extra window and doors-lots of light. I can't wait until I get to see it in person. Thanks for the pictures.